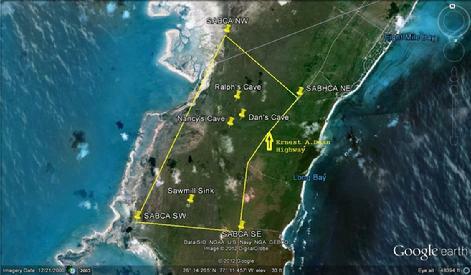 The borders of the proposed SABHCA on Abaco have been reduced and this proposal has been resubmitted. Currently the proposal is under review by the Director of Forestry and by the new Minister of the Environment the RH Kenred Dorsett. The proposal now asks for 5 square miles of land to protect more than 9 miles of underwater passages. Not much else in the proposal has changed. We hope that the Minister will find this change acceptable and move forward with this Proposal. See the link in blue below for the latest version of the proposal. The South Abaco Blue Holes Conservation Area proposal has now passed through two different review processes. The first was through the Director of Parks at the Bahamas National Trust (BNT) where it was reviewed before sending on to the Bahamas Environment, Science and Technology Commission (BEST). The proposal was then further reviewed by BEST and suggestions made before moving up to the office Minister of The Environment where it is now being further evaluated. We hope the Minister, the Honorable Earl Deveaux, will agree that this area is one of the Bahamas most irreplaceable natural wonders. We also hope supporters of this proposal will relay their concern for these amazing caves directly to the Minister himself at every opportunity. We are still moving forward! Thank you to everyone who has assisted us in this two year long journey (so far)! view a pdf draft of the proposal. The final town meetings were conducted on 19th and 20th of October. The first was held in the settlement of Crossing Rocks at the Crossing Rocks School with 18 persons in attendance. Presentations were given by BCRF Projects Coordinator Nancy Albury, and BCRF Director Brian Kakuk. Comments were also made by the Abaco Bahamas National Trust representative Mr. David Knowles. The presentation was well received and many questions were answered. The second meeting was specifically targeted at the hunters of Abaco on the 20th of October at the Friends of the Environment building in Marsh Harbor. Unfortunately this meeting was only attended by two of the hunters, though verbal support has been given by many other members of the Abaco hunting community. A presentation on the SABHCA proposal was given by Brian Kakuk at the new Schooner Bay development which lies on the eastern side of the road from the proposed park area. The presentation was given to Mr. Orjan Lindroth of the Lindroth Development Company and Mr. Keith Bishop, Schooner Bay�s Coastal and Environmental Director as well as several other Schooner Bay employees. The outcome of that presentation was a donation from Schooner Bay in the form of lumber and other materials for the construction of steps, platforms and picnic tables at 3 of the inland blue hole sites within the proposed park. Also donated was the availability of a small generator and expertise from the Schooner Bay team in the actual construction of the platforms, steps and tables! The BCRF and all our partners in the SABHCA project would like to give a huge thank you to Schooner Bay for this amazing donation. We hope that these items will benefit all who come to see these amazing natural wonders that are literally across the street from the Schooner Bay Project. We would like to thank everyone who has supported this proposal from its inception including the Friends of the Environment Marine Committee, Miss Olivia Patterson, Michael and Nancy Albury, Mr. David Knowles, Mr. Eric Carey, Mrs. Lynn Gape, Mrs. Tamica Rahming, Mrs. Marie Donker, Buddy and Cindy Pinder, Mrs. Kay Palitano, Mrs. Cha Boyce, Mrs. Anita Knowles, Mrs. D�Shan Maycock, Mr. Michael Pateman, Dr. Keith Tinker, Mr. Keith Bishop, Mr Orjan Lindroth, Schooner Bay, Mr. Ricky Johnson, Mr. Phillip Weech and many others who have sent letters of support or supplied us with images to support our cause including Mr. Wes Skiles, Mrs. Jill Heinerth, and Mr. Arek Pers. The South Abaco Blue Holes Conservation Area (SABHCA) proposal was delivered to Mr. Eric Carey, Director of the Bahamas National Trust today. We received an e-mail back from Mr. Carey thanking us for all of our hard work on conservation of blue holes and underwater caves and stated that the document would be reviewed by himself and his staff by the 26th of July. After that, the document will be handed over to the Minister of the Environment, the Honorable Dr. Earl Deveaux for review and hopefully submission to cabinet. This will be a long process but we feel like we really have momentum at this time. Thanks to all who have submitted letters of support thus far. We have had letters from all over the world including Japan, China, Greece, Italy, France, Spain, Mexico, The Dominican Republic, Canada, UK and the USA. A special thanks goes out to Curt Bowen of Advanced Diver Magazine who posted a form letter of support on his on-line magazine and his forums. We had over 200 letters in less than 72 hours! THANK YOU ALL! Our efforts will now concentrate on letters of support back here in the Bahamas. We need prominant Bahamians to step up and let the Minister of the Environment and the Prime Minister of the Bahamas know that this conservation area is something that Bahamains want, more specifically, it is something that Abaconians want in their back yard so that they may continue to hunt, fish, play and conducted tourism businesses on the lands, blue holes and creeks within the proposed boundaries without the threat of logging, quarrying or development taking away these precious resources. The Bahamas Caves Research Foundation has partnered with the Antiquities Monuments and Museums Corporation, The Friends of the Environment, and The Bahamas National Trust in an effort to set aside a large area of Crown pineland as well as creek and bay areas that contain some of the most highly decorated underwater caves on earth. All totaled, these sites represent more than 10.3 miles of underwater passages, and most sites have multiple opportunities for continued exploration.